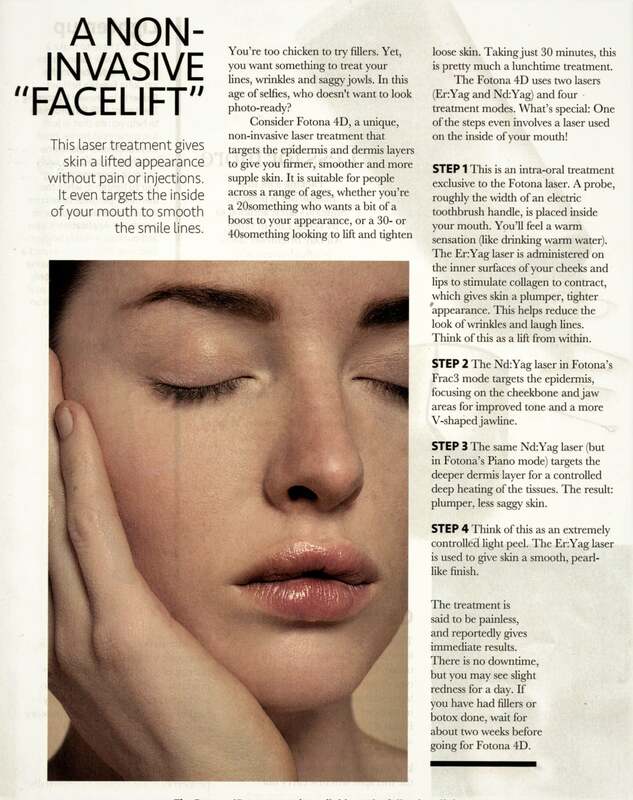 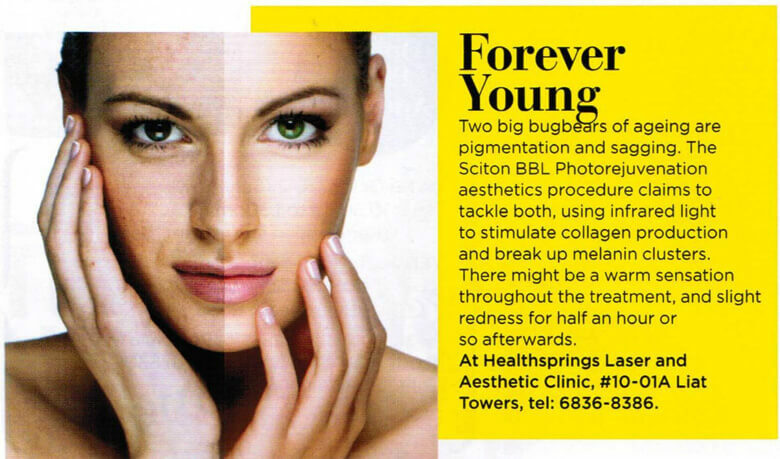 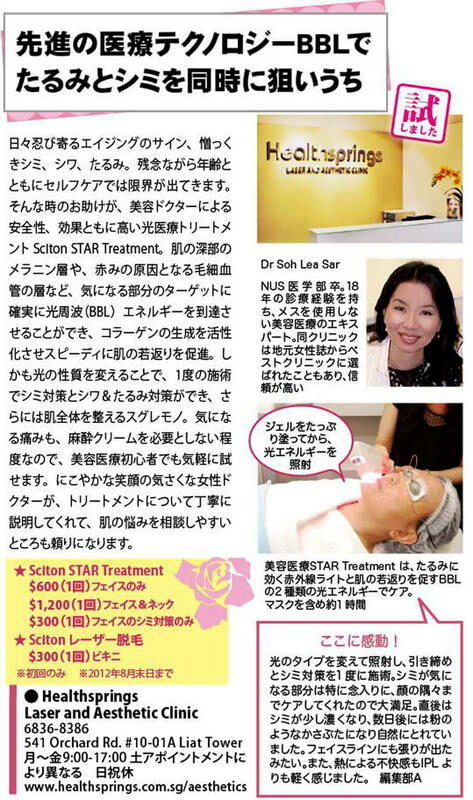 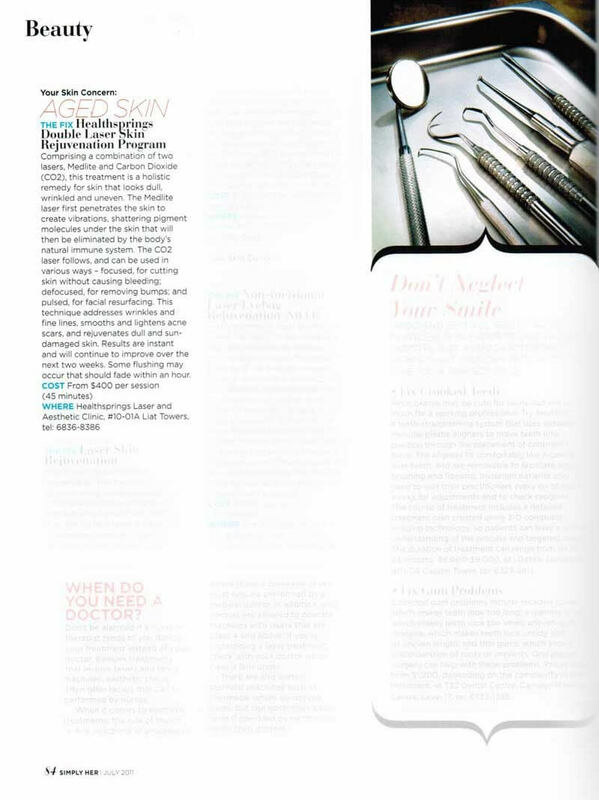 Sciton's 'Forever Young BBL' treatment. 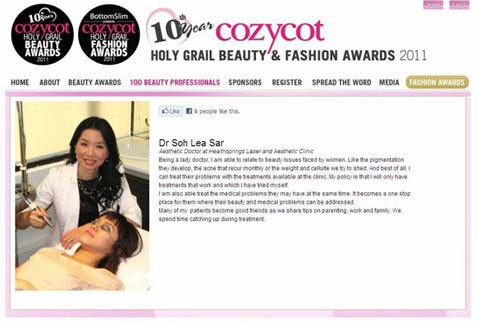 Visit us to experience a comprehensive range of medical aesthetic treatments delivered by our team of well-trained, experienced aesthetic lady doctors. 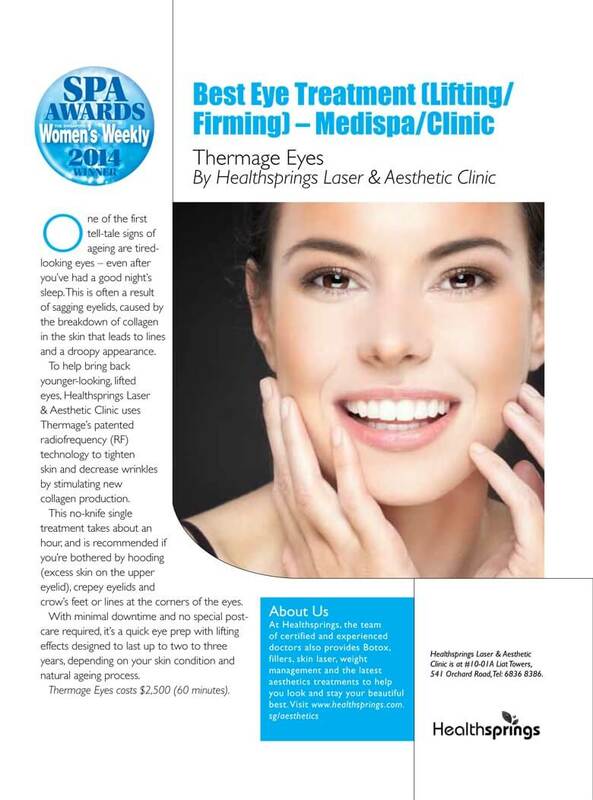 At Healthsprings Laser and Aesthetic Clinic, we offer the latest technique and aesthetic treatments to help you restore and enhance your face, skin and body. 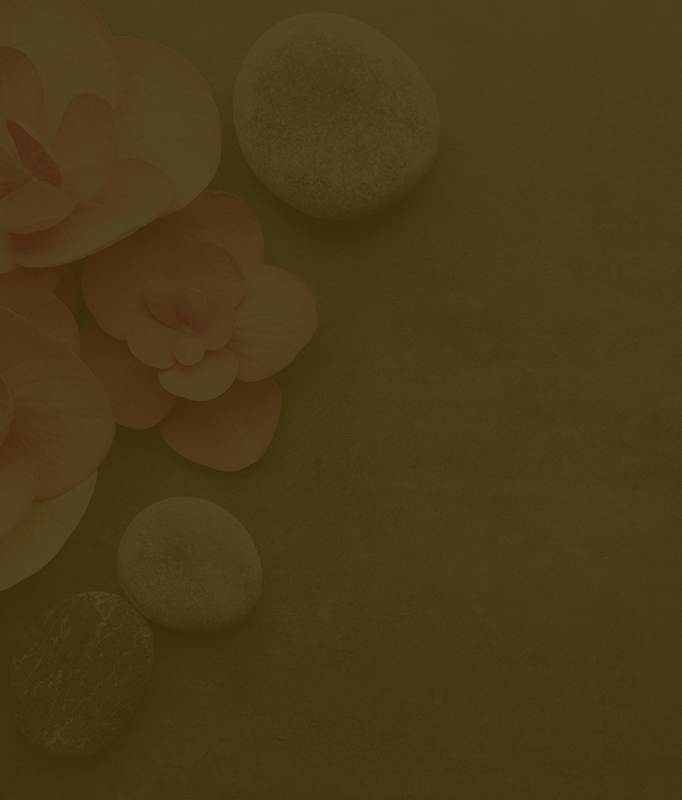 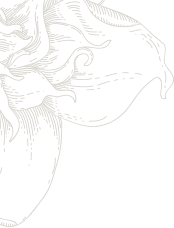 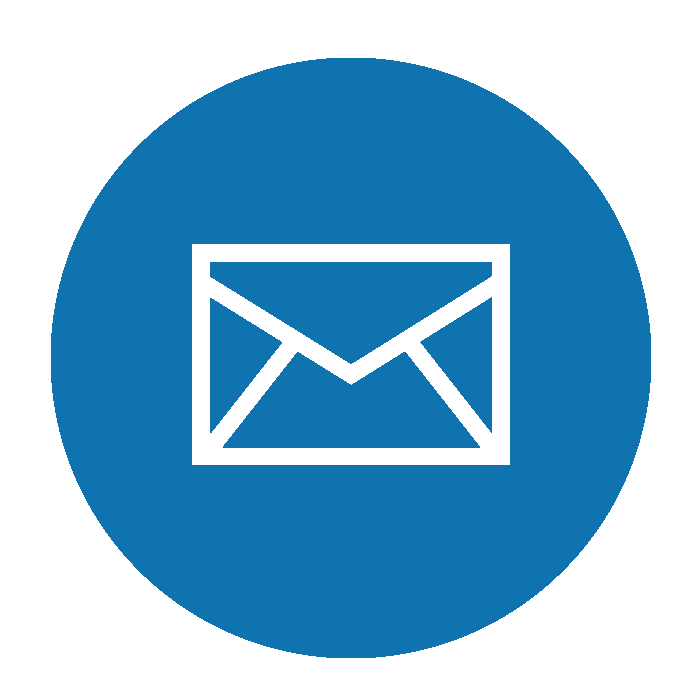 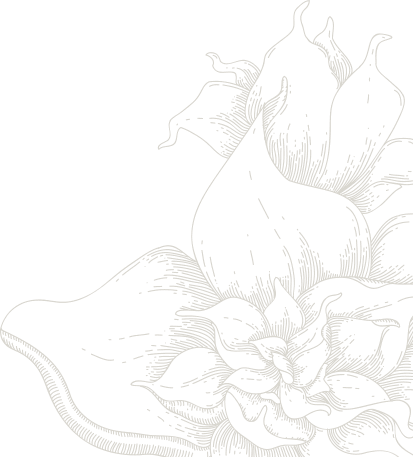 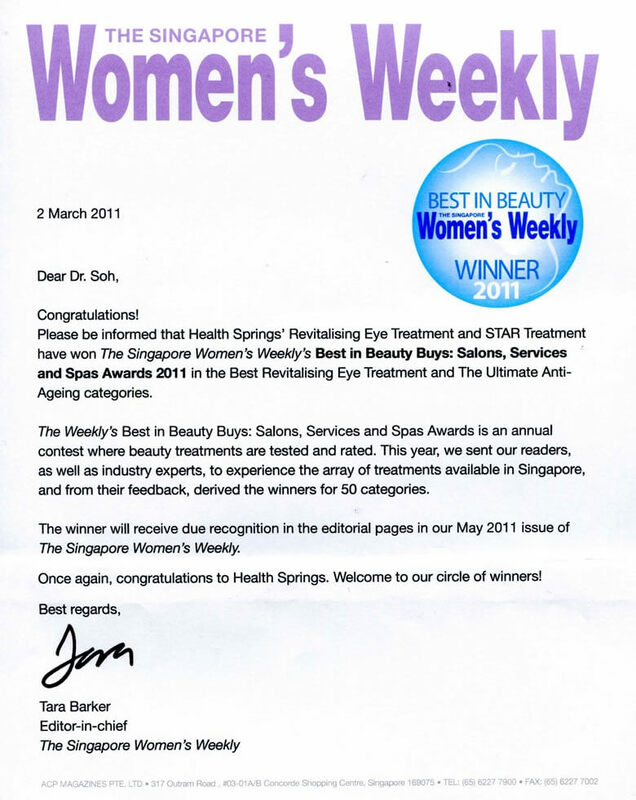 We strive to deliver client satisfaction and deliver optimal results with our treatments. 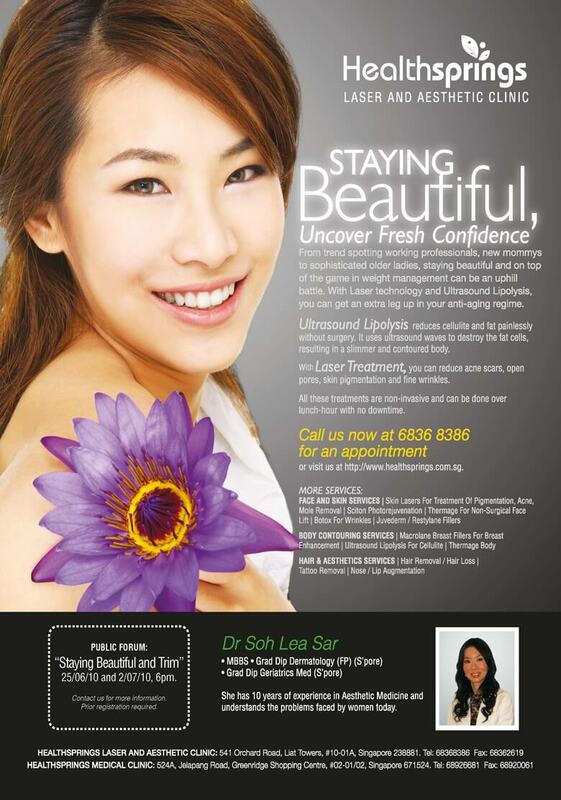 Our clinics are located at Orchard Road (Liat Tower), Bukit Panjang (Greenridge Shopping Centre), and Sengkang (MRT). 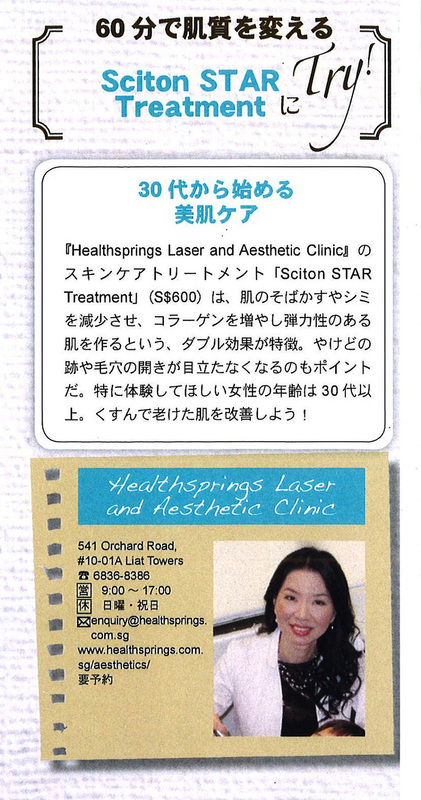 Make Healthsprings Laser and Aesthetic Clinic your partner in maintaining beauty and health. 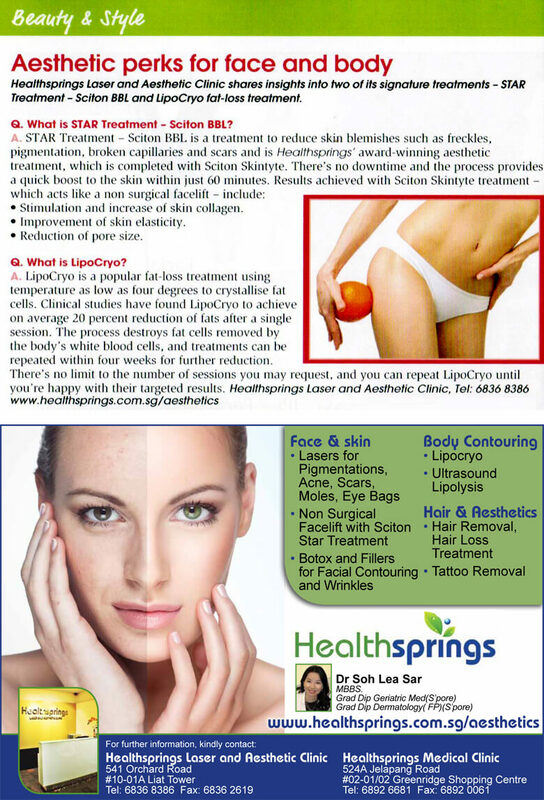 We treat skin conditions like skin pigmentation, acne and scars, keloids, moles and eczema. 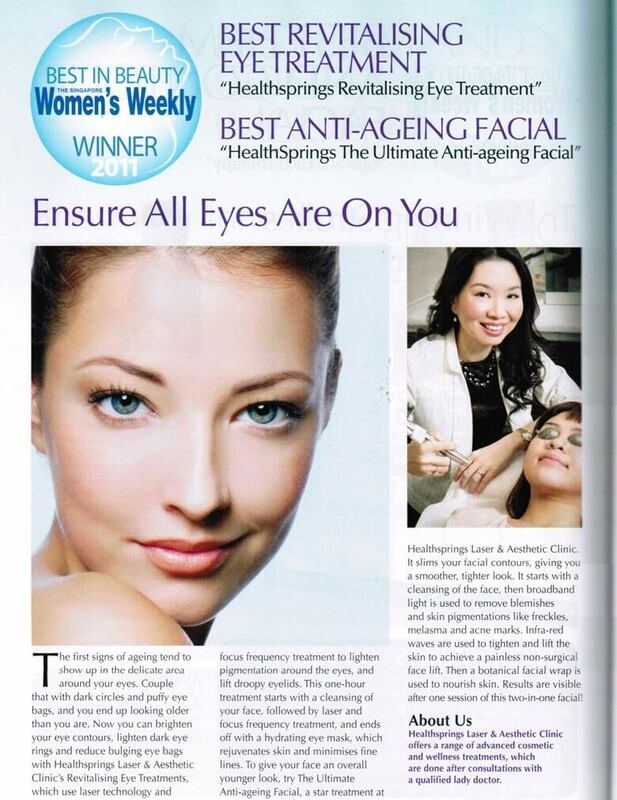 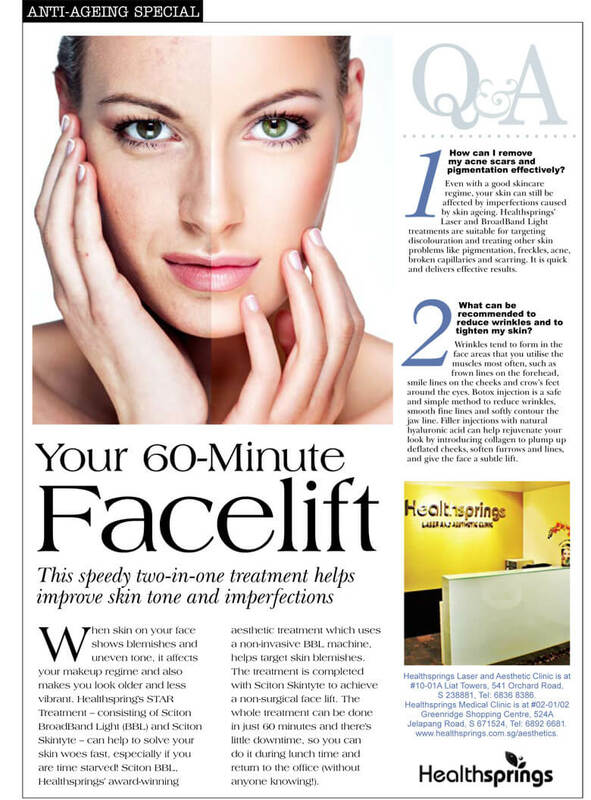 We assist in face rejuvenation, whitening, anti-aging and other skin-related issues. 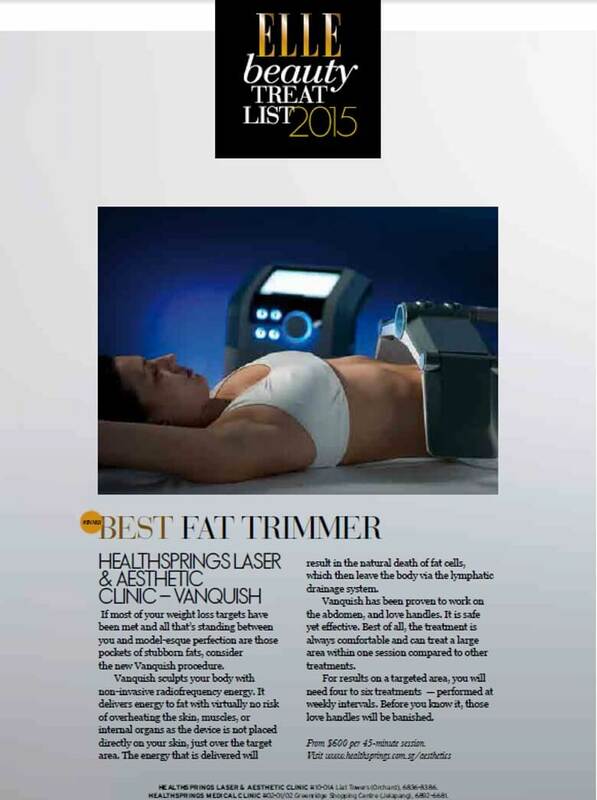 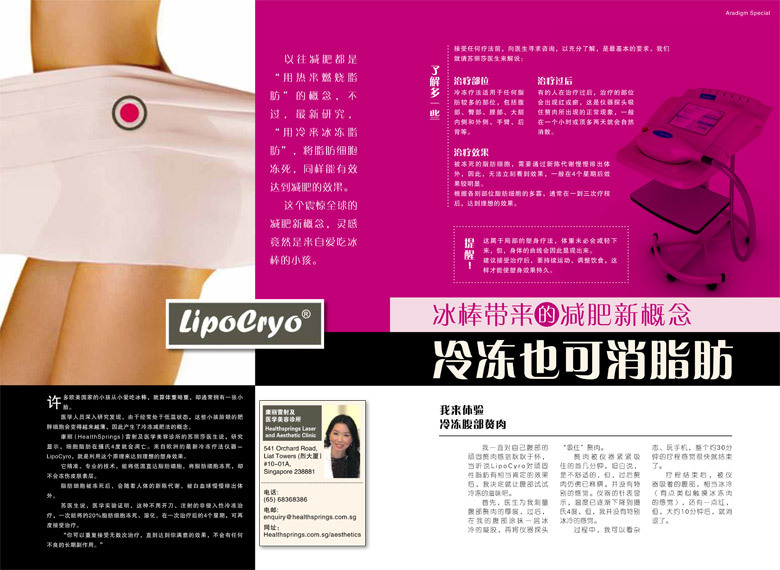 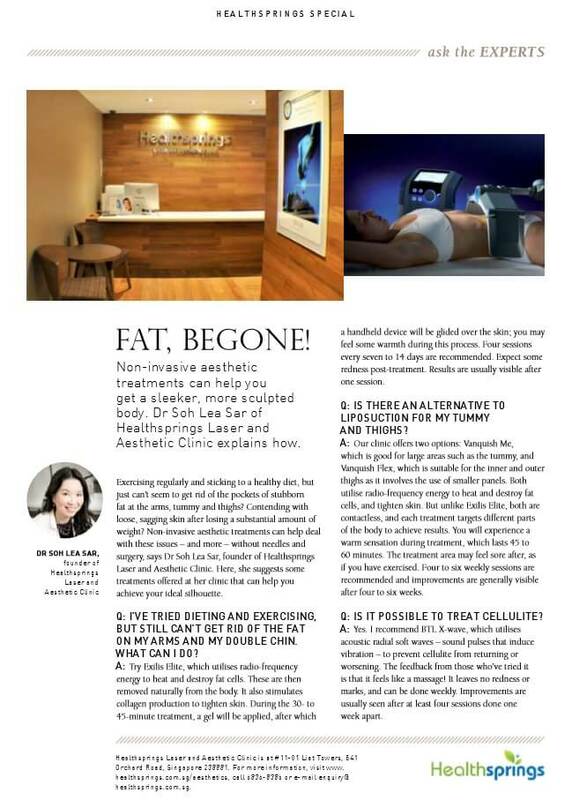 We offer body contouring treatments to help you remove any unwanted fats. 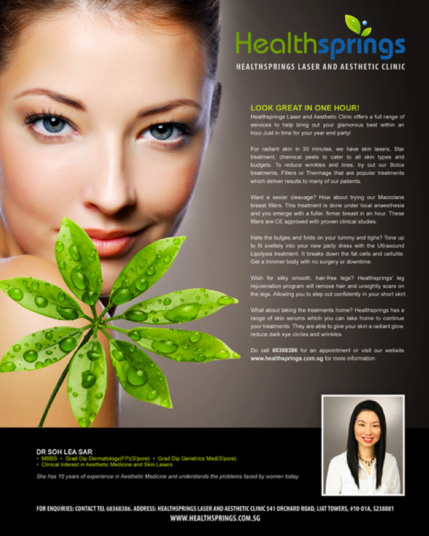 Our experienced and qualified aesthetic doctors can assist you in your beauty care issues. 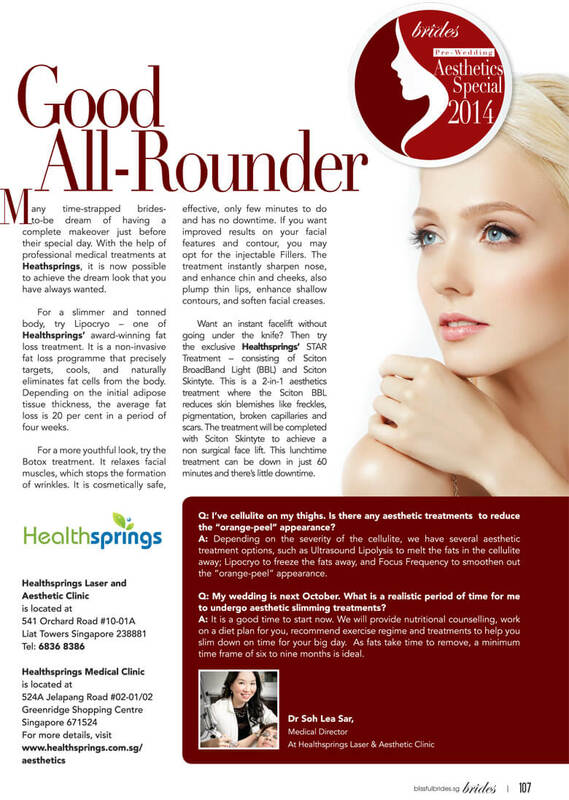 We have a list of treatments for face and skin care, body contouring and hair & aesthetics for your total beauty well-being. 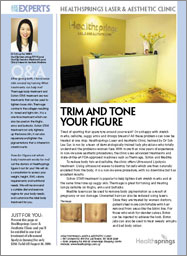 At our clinic, we take a multi-pronged approach towards weight loss management and body slimming. 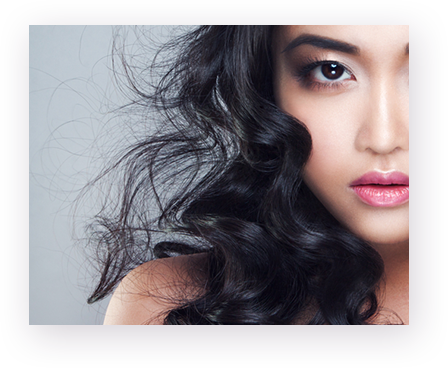 Consultation with our trained doctors will be done to assess the cause of the hair loss. 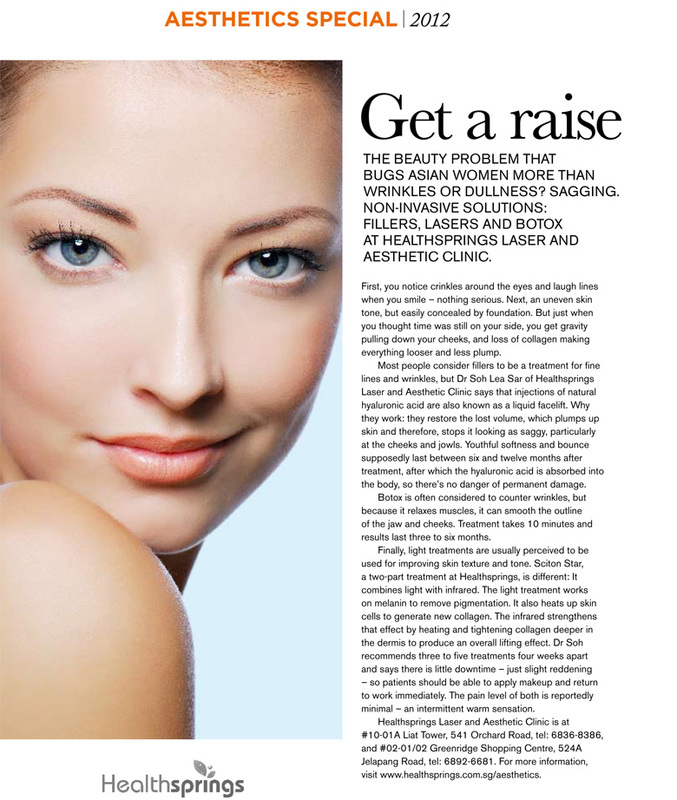 Treatment may include shampoo, scalp lotions, oral medication and hair laser therapy. 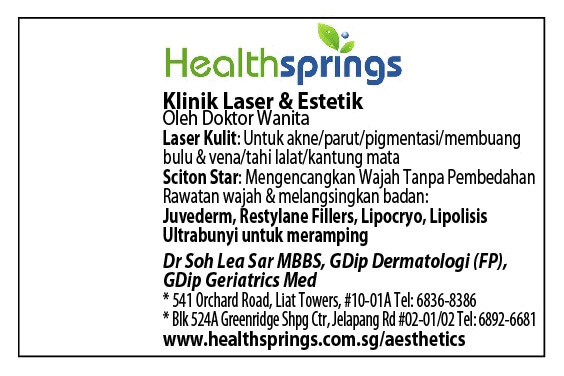 Healthsprings Laser & aesthetic clinic Singapore was established in 2000 with its first medical clinic located at Bukit Panjang. 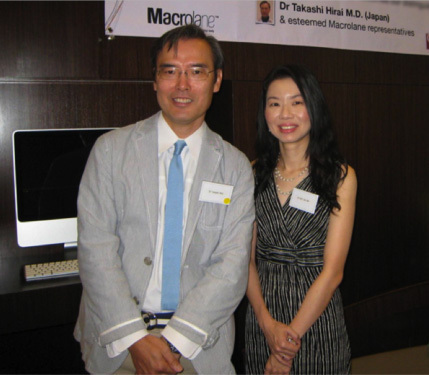 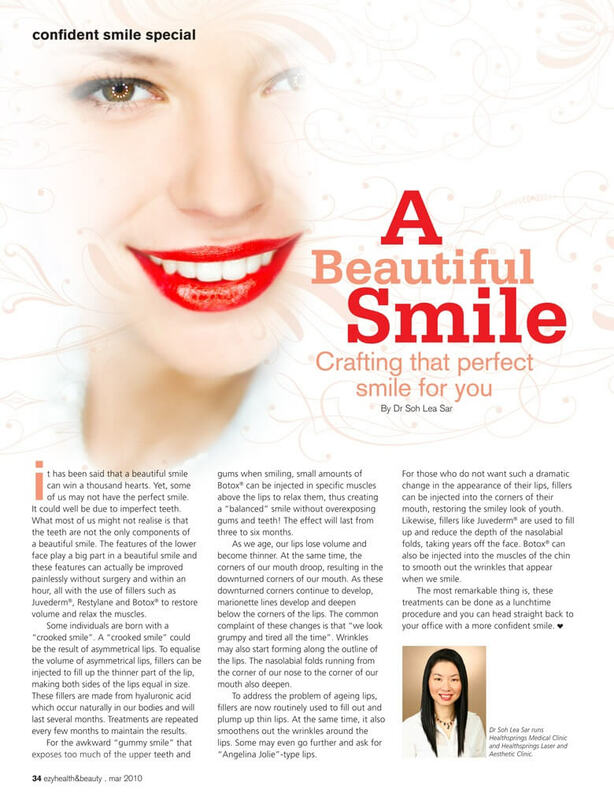 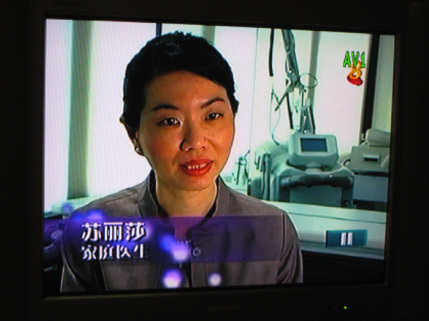 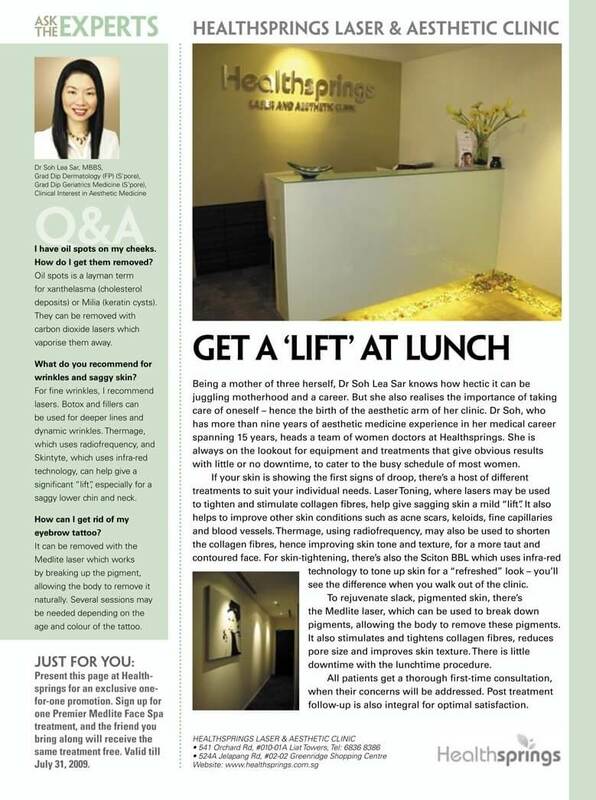 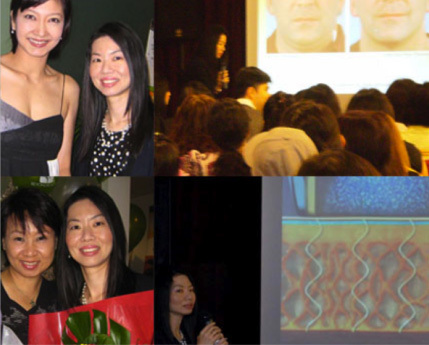 In 2001, the company ventured into the medical aesthetic field and has become one of the first aesthetic clinic in Singapore to offer Lasers, Peels, Fillers, Botulinum Injections and other aesthetic services. 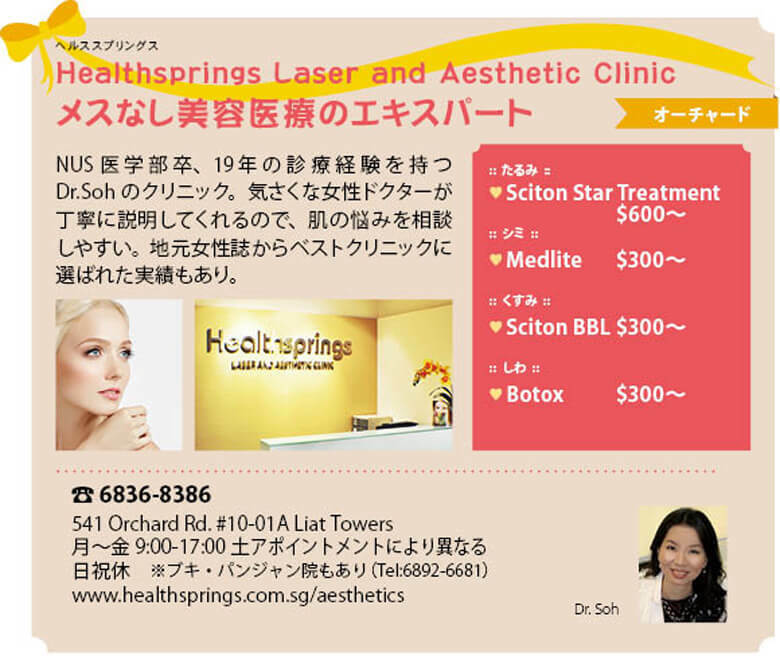 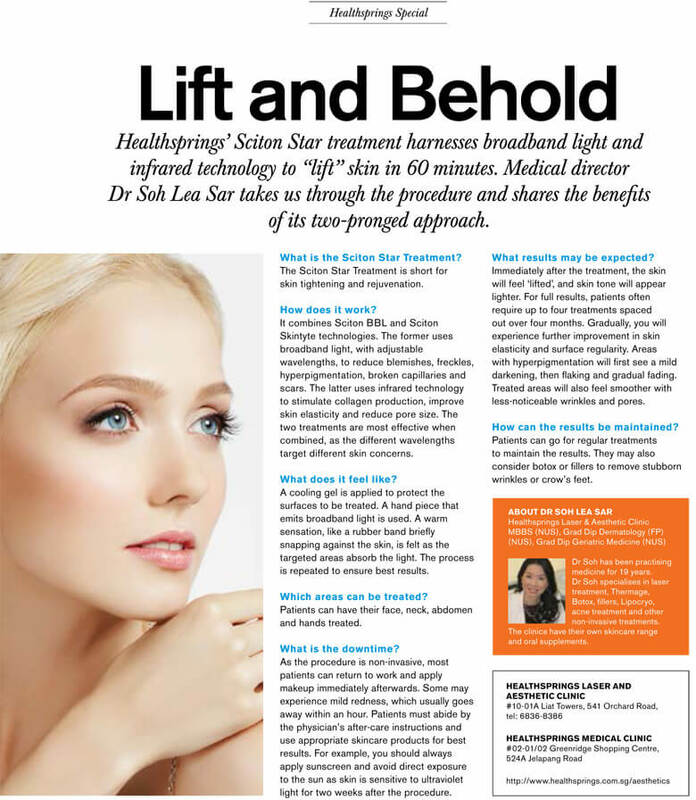 In 2008, Healthsprings Laser and Aesthetic Clinic is opened in Orchard Road and has been known to specialise in different aesthetic procedures for the skin, face, body, and hair. 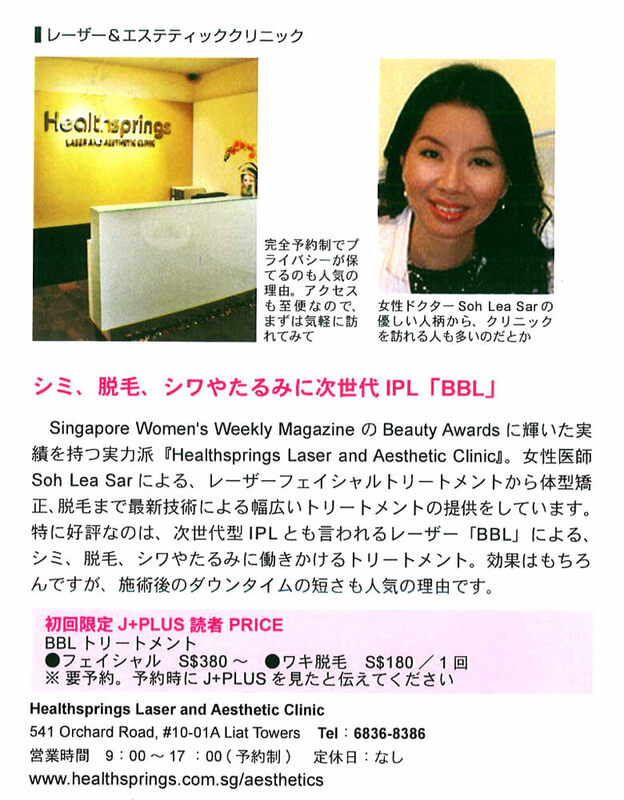 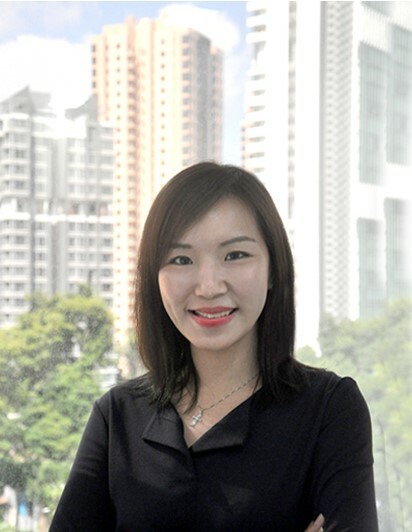 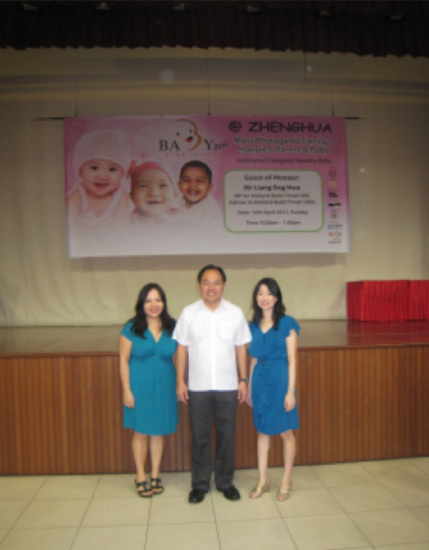 In 2014, the company launched an online shop called Healthsprings Shop, where Dr. Soh’s, an aesthetic doctor based in Singapore, specially-formulated skin care products are sold. 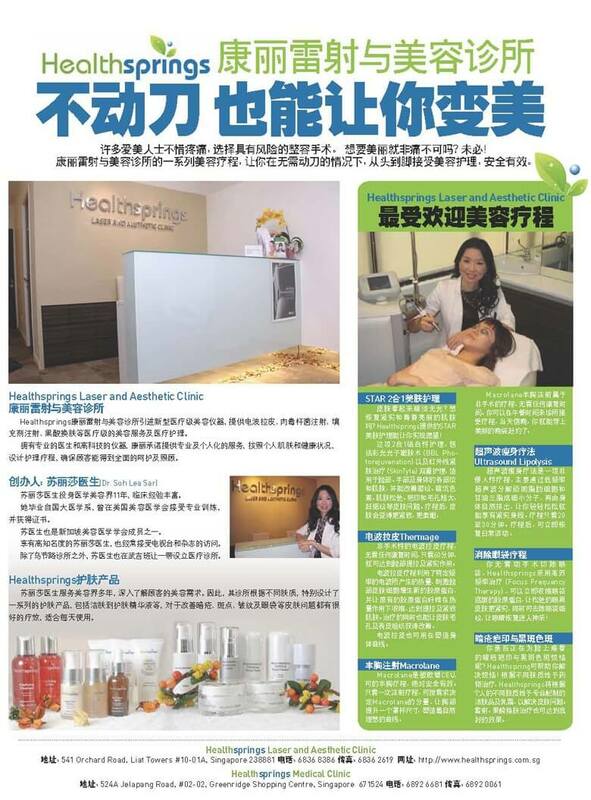 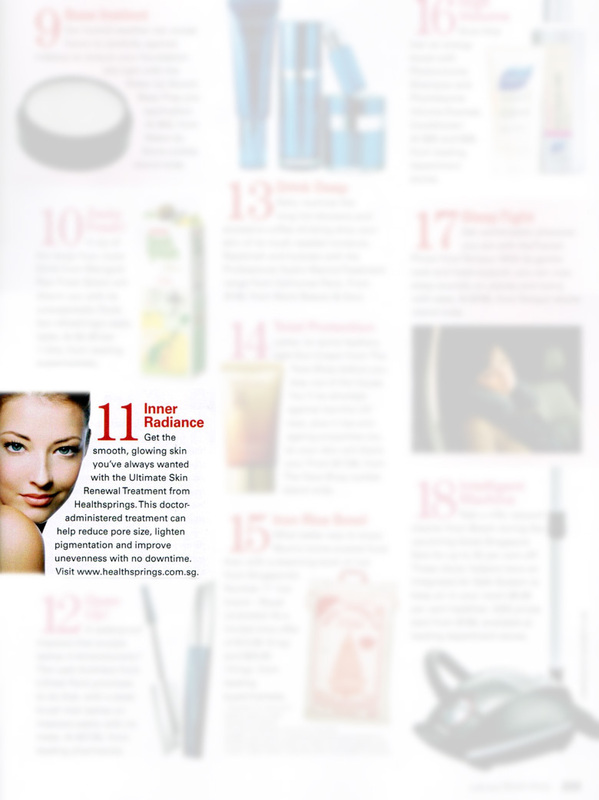 These products cater to help treat various skin problems and to provide pre- and post-aesthetic treatment care in Singapore. 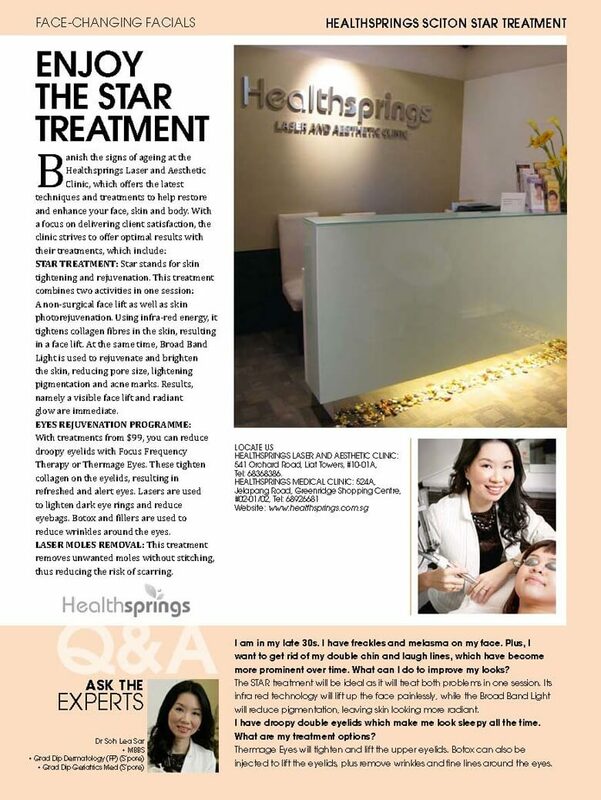 The company’s spa-concept centre, Healthsprings Aesthetic Singapore, then opened in 2016, offering various medical-grade beauty care services. 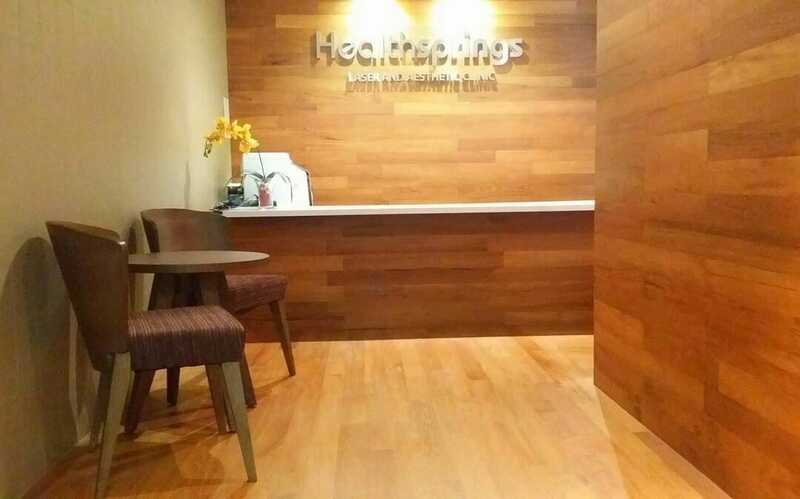 At Healthsprings, we believe that “You can’t reverse your age, but you can decide how you want to age.” We at Healthsprings can give you the treatment programs you need, specially tailored to your age, conditions, and concerns. 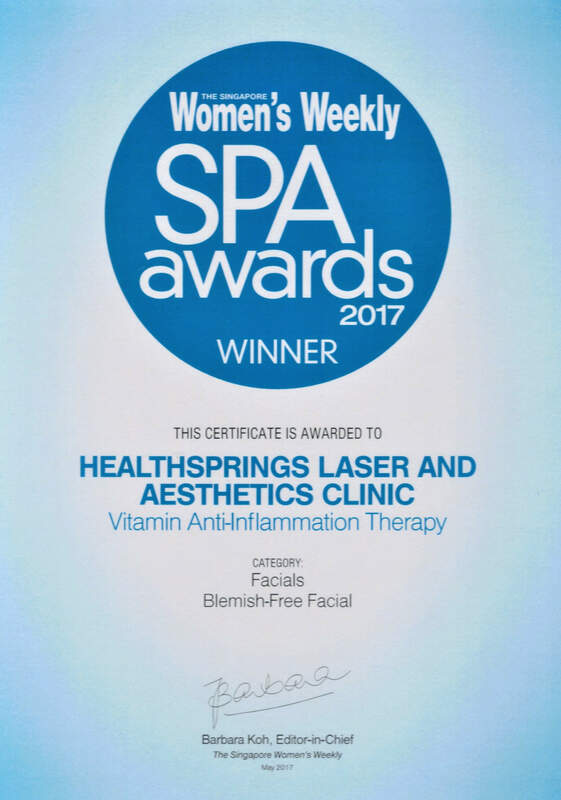 With almost 20 years practice, the Healthsprings Aesthetic medical clinic team is confident that we have the knowledge, experience, and skills to help you with anything that concerns your top to toe health and wellbeing. 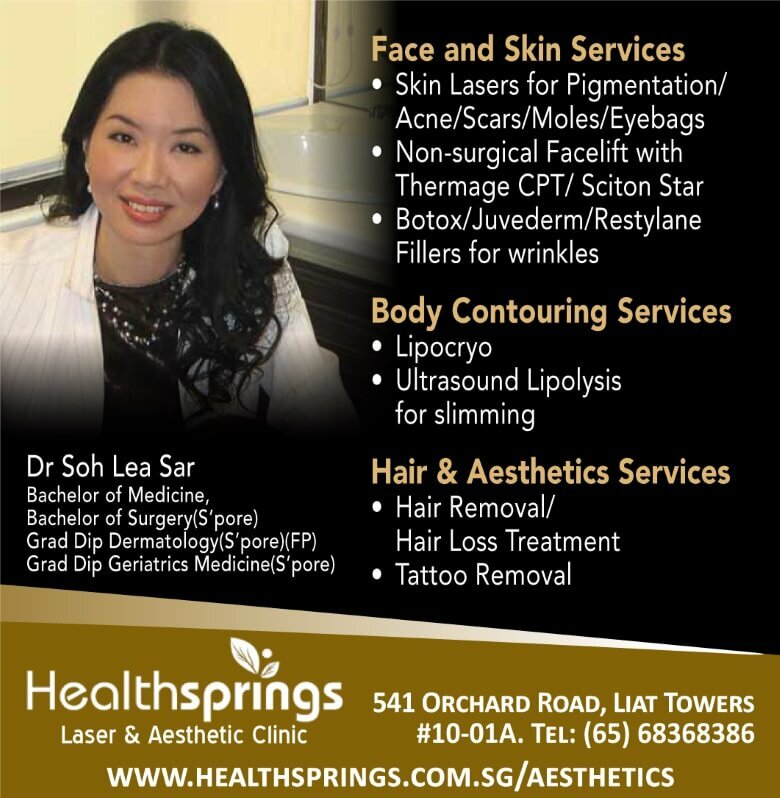 Access to the latest medical aesthetics treatments in Singapore delivered by our team of certified and well trained lady doctors. 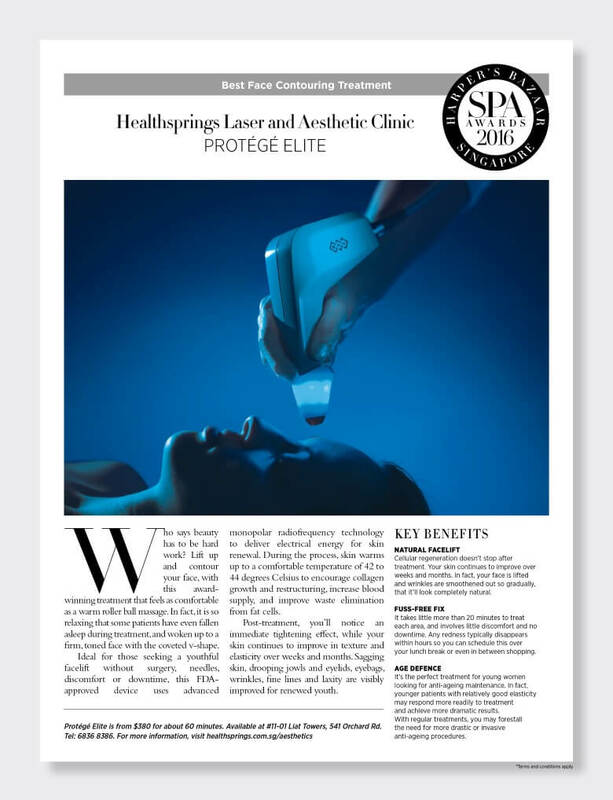 Consultation with our aesthetic doctors to develop a treatment program tailored to address your concerns and deliver desired results; Worry free aesthetic treatments and after treatment products to enable self maintenance at home; Follow up contact with our clients to review results. 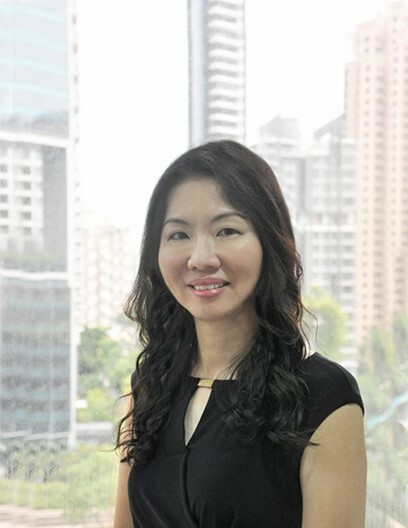 We offer various effective Singapore aesthetic treatments to help you manage different skin conditions like acne and acne scars, eczema, skin pigmentation, keloids, and more. 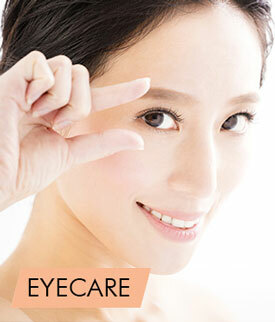 Acne, pigmentation, dark spots, and wrinkles are some of the common skin conditions that people have. 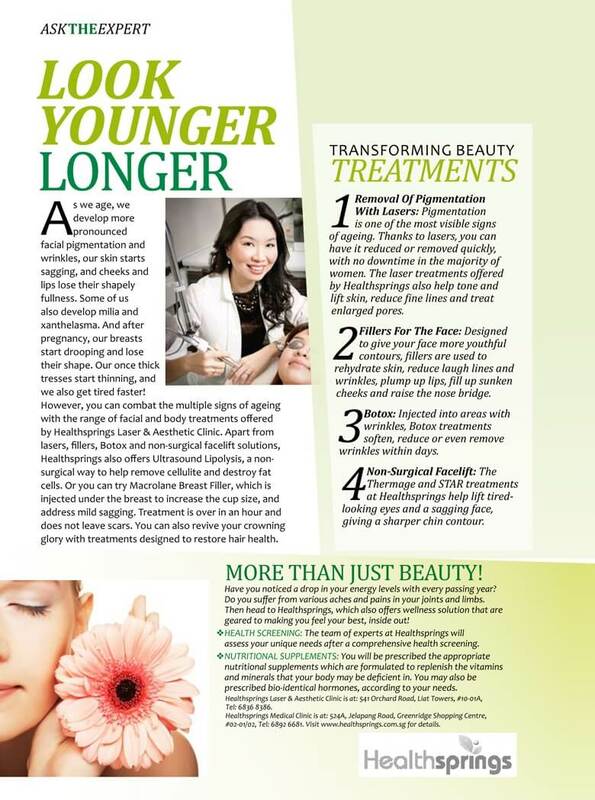 While they might not affect our health directly, it can affect our appearance and even take a toll to our self-confidence if they keep on aggravating. 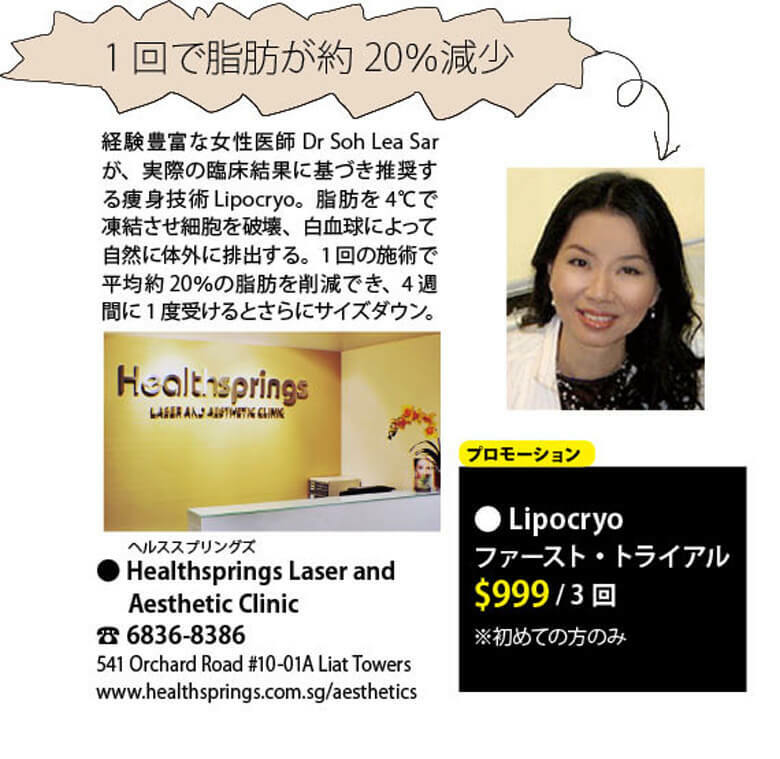 Let our aesthetic doctors in our Singapore clinic help you treat your acne and get rid of those pesky acne marks! 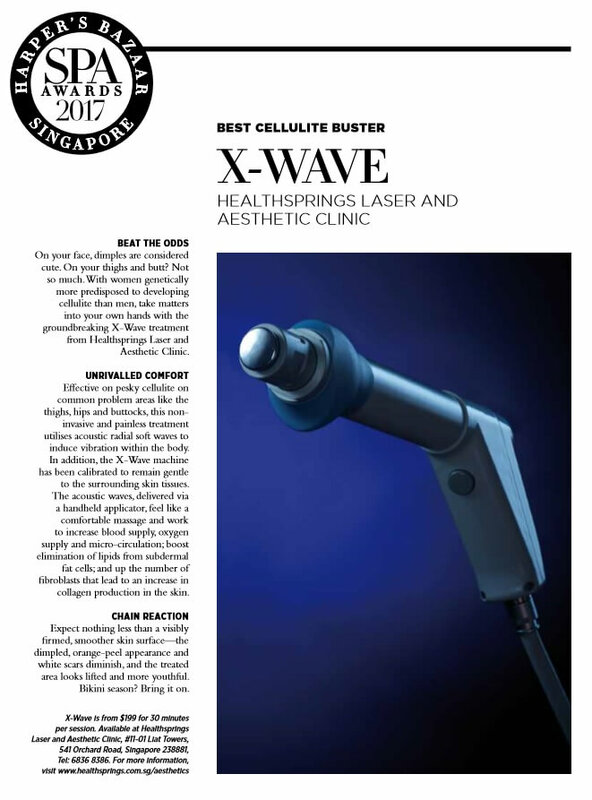 This aesthetic laser clinic in Singapore have laser treatments, chemical peels, light and radiofrequency treatments to solve different skin problem. 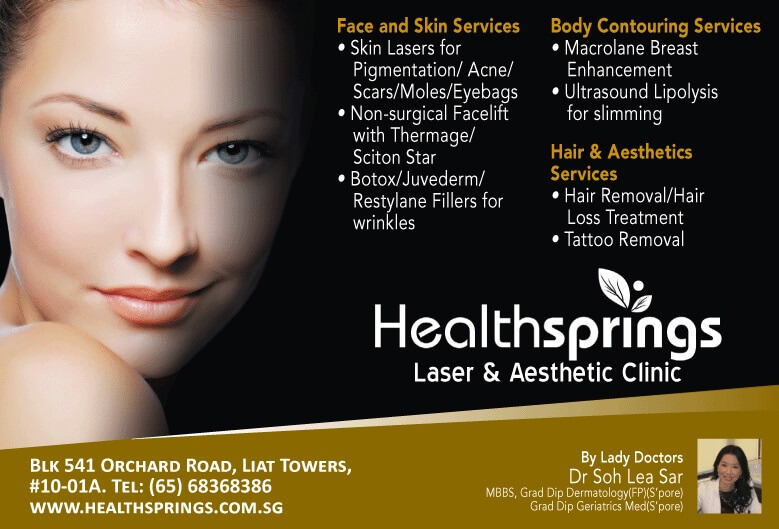 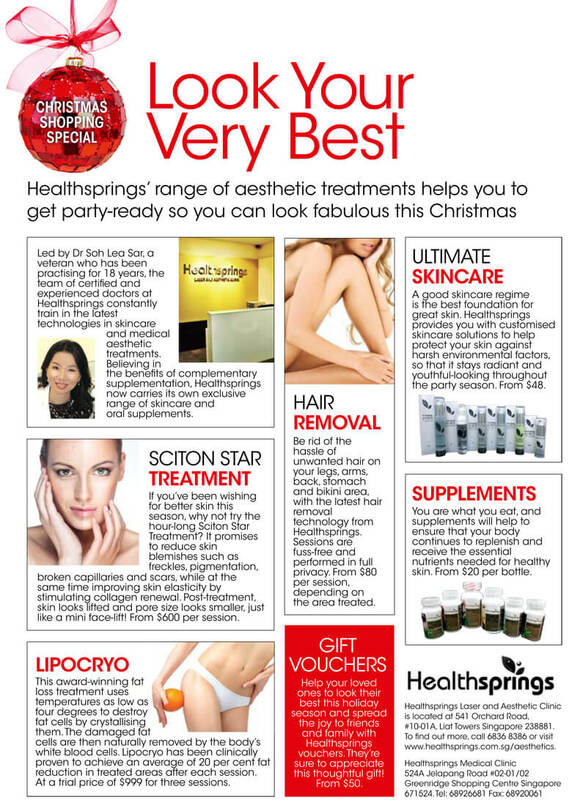 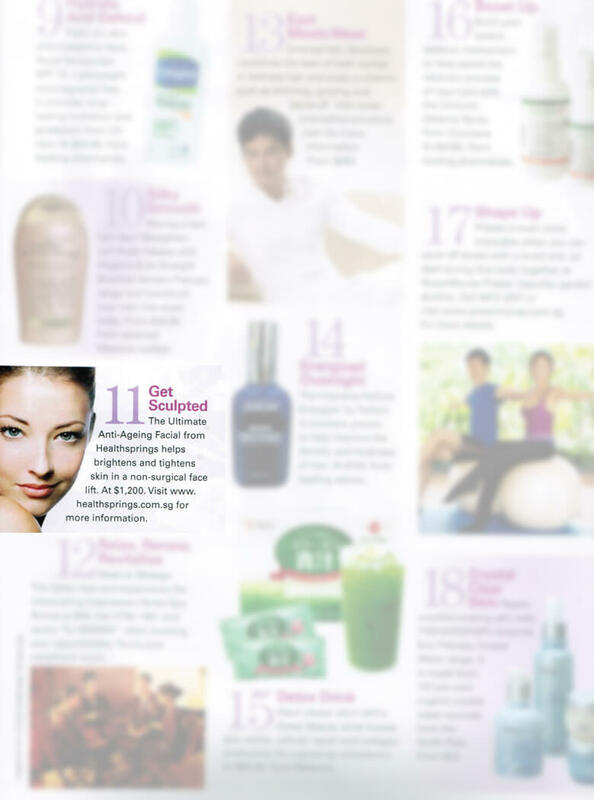 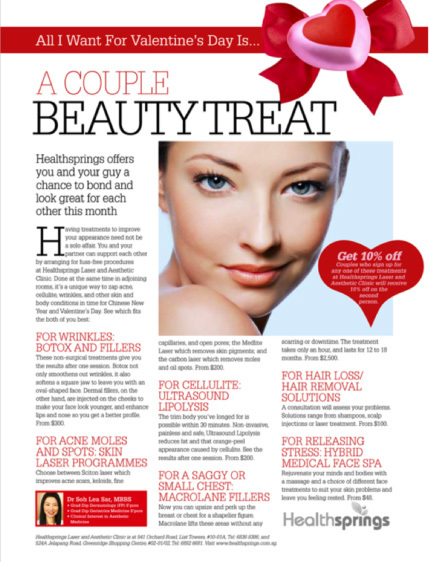 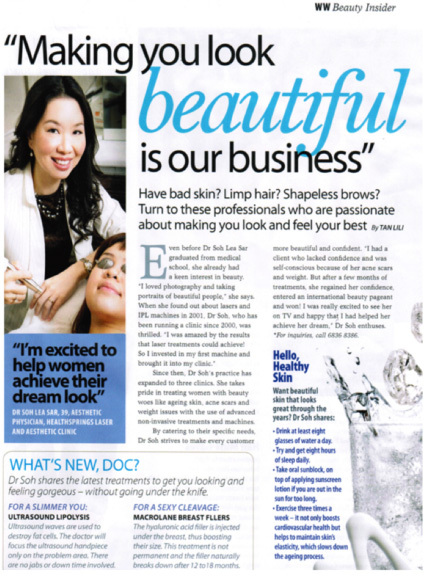 Name your skin problems or concerns and we at Healthsprings Singapore aesthetic clinic can help you solve it! 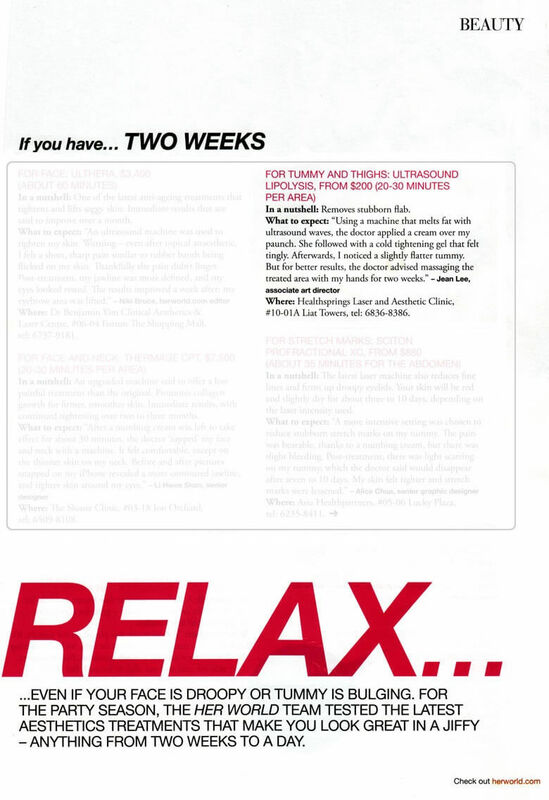 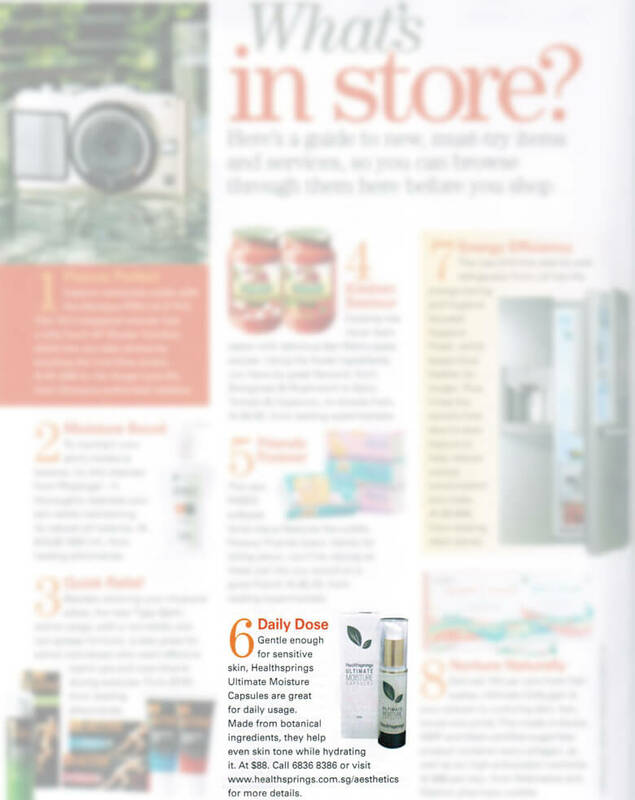 The Finder September 2010 "Look Good, Feel Great"